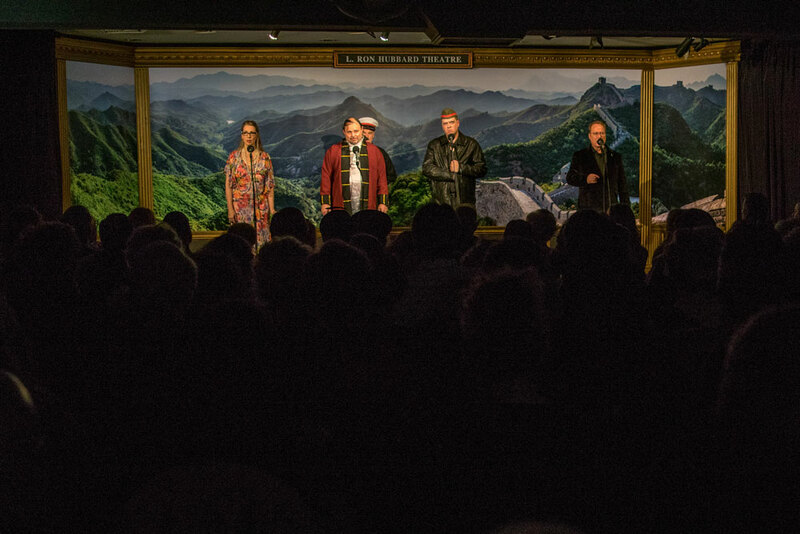 The 10th anniversary of the Stories from the Golden Age was celebrated Saturday night at the L. Ron Hubbard Theatre in Hollywood, CA with a live old-time radio theatre presentation of “Spy Killer,” a mystery pulp noir story from 1936 written by L. Ron Hubbard, featuring renowned voice talent with a musical opening. The building was festooned with 10th-anniversary banners and an attractive window display featuring the entire line of L. Ron Hubbard books. 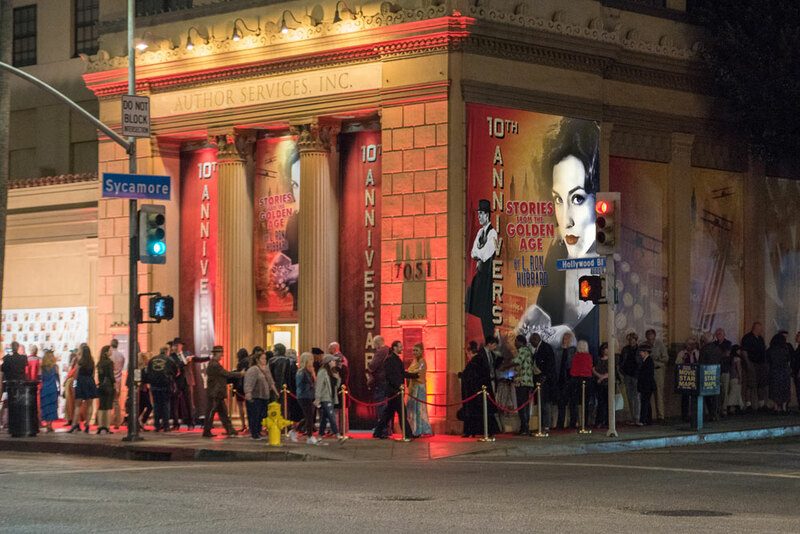 The red carpet along Hollywood Blvd in front of Author Services, Inc., provided an appropriate entrance for an evening that began with a musical performance of 1940s songs sung by actress/singer Victoria Summer (“Saving Mr. Banks”). This was followed by a live old-time radio theatrical presentation of “Spy Killer,” performed by Rajia Baroudi (“Power Rangers,” “Call of Duty,” “World of Warcraft” voice actor), Jim Meskimen (“There Will Be Blood,” “Magnolia,” George Washington in Geico ads), David Sharp (“Shadows,” “Puncture”), R.F. Daley (“Bridesmaids,” “Vacation”), Johnny Ferretti (“Target,” “Beyond the Game”), Michael Yurchak (“Club Dread,” “Beerfest”), Alies Orozco (“Underdog,” “Megalodon”). 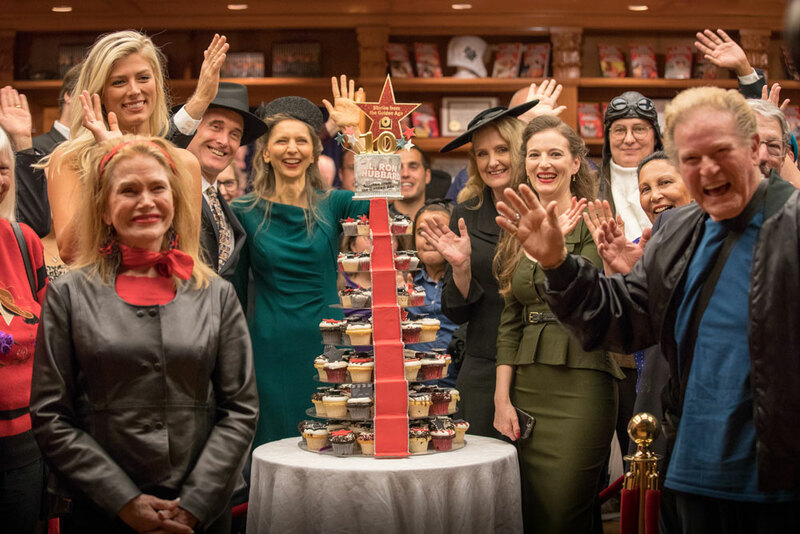 Following the performance, guests were invited upstairs to the library for a lavish party that included a three-and-one-half foot tall custom cake designed by Cake and Art for the occasion containing 153 designer cupcakes representing each of the 153 stories in the series. Plaques commemorating the anniversary were also received from AudioFile Magazine, True West Magazine, The Strand Magazine, and Library Journal Magazine and placed on display. The Stories from the Golden Age is a line of 80 books and audiobooks launched in 2008 containing 153 stories written by L. Ron Hubbard in the 1930s and ‘40s in the genres of science fiction, fantasy, mystery, westerns, and action/adventure. To date, over 2.7 million copies have been sold. Combined, the series has received over 50 major industry awards. “Spy Killer” is one of L. Ron Hubbard’s most recognized and best mystery books in the mystery genre.